People underestimate you, don't they? They don't see what's inside, all of that spirit, that fight, that, dare we say... ferociousness. But ferocious is exactly what you are. You're a hungry and wild beast and you get what you want. That's what being a lion is all about. 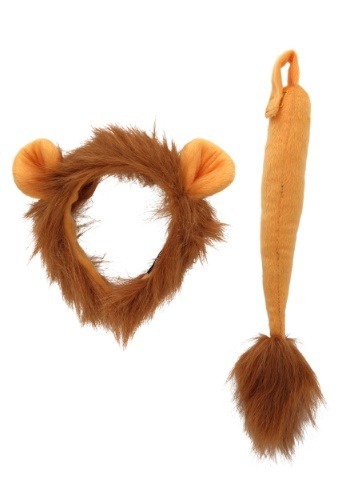 When you put on these ears and tail, you're not wearing a simple costume accessory. No, you're freeing the beast within! Because you're not someone to be pushed around or ignored. You're a lion! More than that, you're a wild man-eating lion, and you take no prisoners. Put on "Welcome to the Jungle" at full volume because you're about to roar! Don't let anyone push you around, lion. Find your courageous, ferocious heart with these ears and tail and roar your way through your life at full speed. You take down gazelles, you chase elephants. You're a lion! Now let's hear that roar! I wish the ears had a little more of a mane. But not bad for the price.